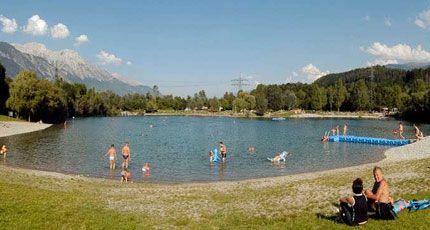 The popular bathing lake in the district of Rossau has a surface of 0,036km² and is the second-largest lake in the area of Innsbruck. The natural Baggersee Rossau is a popular recreation destination for locals and Innsbruck tourists. Water slides, children playgrounds and brooks for playing provide for plenty of fun for young guests. The sunbathing area of 53,000m² offers plenty of space for all visitors. Sports are also offered at the lake: beach volleyball, badminton, street ball, table tennis. A crazy golf course is next to the lake and offers fun for the young and old. In summer the bathing lake’s water temperature gets up to a pleasant 24°C. Please enter your check-in and check-out date in order to find available accommodations and to calculate the exact amount.